There's no question that Internet connectivity is one of the most important operational functions of any business. Because of the importance of Internet connectivity, an organizations worst nightmare is losing its Internet connection. Whether it's due to a power outage, extreme weather or an unforeseen problem, we have all experienced unpredictable Internet loss at one point or another. Now, with the new Nebero load balancer and redundancy solution, users are able to combine up to 16 different Internet connections and use them simultaneously. 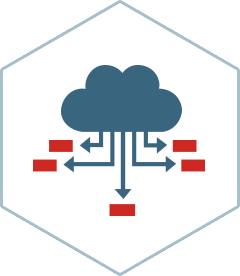 By utilizing load balancing and redundancy, we have ensured that all of your network connections are being maximized to their full potential and capabilities. In addition, Nebero Systems ensures that you will never be left without an Internet connection again. When this solution is being used, all Internet traffic will be routed to a specific designated location based on a particular protocol, IP address or network destination. Although load balancing and redundancy is not always being utilized, it is always enabled to provide a unique and effective solution to certain organizations and agencies that require maximum connectivity and encounter high levels of traffic. Once network load balancer and redundancy has been implemented, additional failovers may be setup to provide specialized redundancy for optimizing Internet uptime for business operations and disaster recovery. To obtain maximum load balancing and redundancy, a variety of different Nebero UTM deployments are put together as a cluster. Offered under our solutions category, this product has helped many different businesses achieve exclusive organization success. Additionally, there are different variants of the Nebero Systems UTM - Basic, Standard, Premium and Enterprise. Each variant allows for easy management of 16 simultaneous Internet connections (DSL, ILL, 3G/4G, VSAT, Fiber Cable etc.) from the same or different Internet Service Provider. The ability to incorporate high redundancy into critical mission systems. Customized approach that is designed to match your exact solution needs. Intelligent management of visitor flow during times of high traffic. Various hardware options and pricing choices.